In the Main Menu, click eServices, Web Sched, Notify tab. When a patient successfully books a Web Sched Recall, Web Sched New Patient, or Web Sched ASAP appointment online, you can opt to send them an automated message via text, email, or both to notify them about the appointment details. Notify messages can be turned on by clinic and by service. Note: For more information about each service, see Web Sched Feature. Each service has its own section: Recall, New Patient, ASAP. In addition, when you have multiple clinics, you can create default messages for all or some clinics, or customize messages per clinic. Note: To undo all changes made since the window was last opened, click Undo All. Communication Method: For each service, select the method of sending the notify messages. None: Do not send notify messages for the service. Text: Only send notify messages via text. Email: Only send notify messages via email. Text and Email: Send both email and text notify messages. Text Message: Customize the message sent via text. 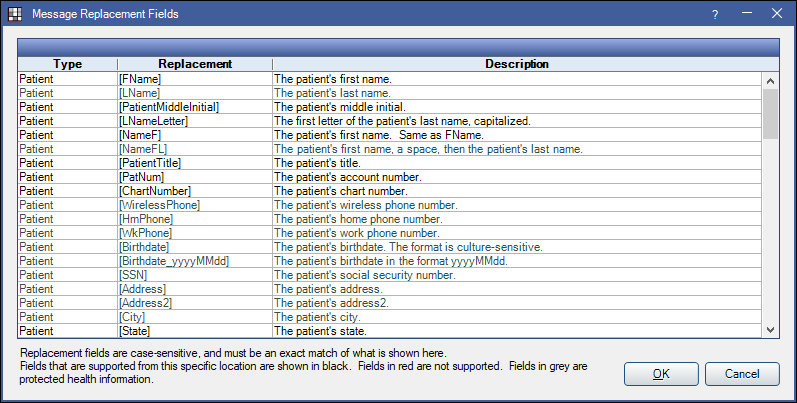 Right click in the text box to insert a Message Replacement Fields that dynamically inserts patient data into the message text. Email Subject and Body: Customize the email subject line and body text. When there are multiple clinics, you can customize settings by clinic. Clinic: Select the clinic to apply the settings to. To set defaults for multiple clinics, select Defaults, then change the settings. To customize the settings for a specific clinic, select the clinic, uncheck Use Defaults, then change the settings. To apply default settings to a clinic, select the clinic, then check Use Defaults. Communication Method: For each service, select the method of sending the verify messages. None: Do not send verify messages for the service. Text: Only send verify messages via text. Email: Only send verify messages via email. Text and Email: Send both email and text verify messages. Text Message: Customize the message sent via text. 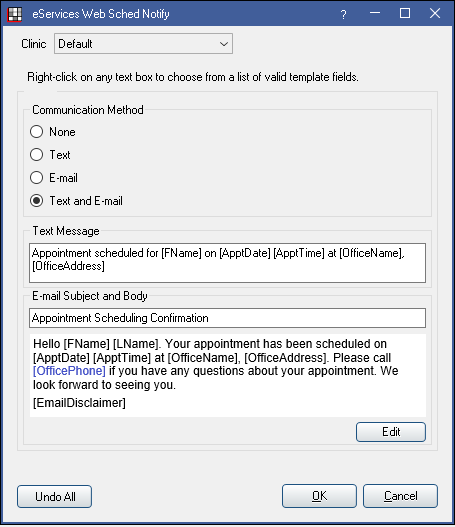 Right click in the text box to insert Message Replacement Fields that dynamically insert patient data into the message text. Both email and text messages can include Message Replacement Fields that dynamically insert patient data from the database. The fields available for each service vary. Right click in the Text Message, Subject, or Body text box, then click Insert Fields to view available Message Replacement Fields. Fields in black text are available for the service. Fields in red text or not. Greyed out fields are considered protected health information (PHI) and cannot be inserted into text messages because texting is not a secure method of sending PHI. Double-click a field to insert it in the current cursor location.